When Plastic Surgeon Brian Brantner, MD, sold his practice in 2014 after 33 years, he never really thought he’d be performing surgical procedures again. Moving from California to Arizona was an opportunity to kick back and perhaps retire. But, Dr. Brantner found himself unchallenged by retirement and, felt compelled to again use the highly trained skills he’d spent so much of his life honing. So, last year he began serving in a backup surgical role for the Arizona Dermatology Group in Prescott, which has become a full-time practice helping patients through plastic surgery. 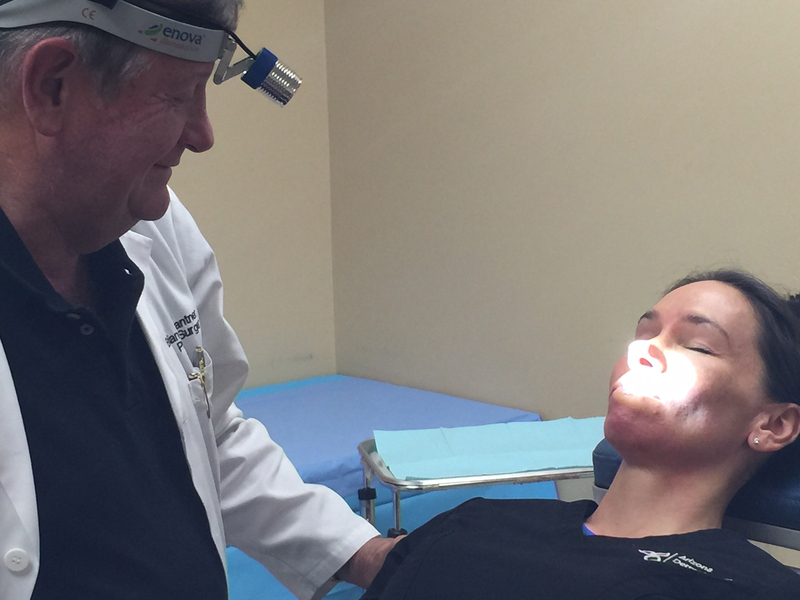 Shedding Light caught up with Dr. Brantner to ask him about his practice and his new Cyclops XLT-125 LED surgical headlight. Shedding Light: What’s your practice like today? Dr. Brantner: Before coming to Arizona, I owned my practice and my time was divided between performing surgery and doing administrative work. It was very time-consuming and somewhat stressful. I’ve always enjoyed plastic surgery and now that’s all I’m focused on. Shedding Light: Tell us a bit about Arizona Dermatology Group. Dr. Brantner: Arizona Dermatology Group offers a range of services that encompass medical, cosmetic and surgical dermatology. At first, I wasn’t sure if plastic surgery would fit into the practice of dermatology, but it is coming together nicely. I have a background in general, ENT and plastic surgery and initially I performed backup ENT surgeries to address nose, head and neck defects. Now, the Group is expanding its services to include plastic surgery and I’ve been performing facelifts, open rhinoplasty, and other cosmetic surgeries. Shedding Light: How did you hear about Enova Illumination LED Surgical Headlights? Dr. Brantner: In the past I’d used corded, fiber optic headlights and when I started at Arizona Dermatology Group I started looking for a different option. I found Enova doing an online search and was very intrigued by the portability of their headlights. Shedding Light: How do you like your Cyclops XLT-125? Dr. Brantner: It is far brighter than the fiber optic headlights I’ve used. Because it is LED-based, I’m no longer tethered to a power source and I can walk completely around the patient during surgery. The quality of the light is extremely good. It provides excellent color rendition and doesn’t throw off what I see. And, the XLT-125 is so lightweight I often forget that it’s on my head! Shedding Light: What do you think about the adjustable aperture and bracket on the XLT-125? Dr. Brantner: Enova really knew what they were doing in designing this headlight. Once I set the appropriate spot size and adjust the angle of the headlight, I literally don’t have to touch it during surgery. Shedding Light: How does the LED surgical headlight compare to a fiber optic headlight? Dr. Brantner: The first time I used the XLT-125, I kept looking behind myself for the cord! It was a habit I developed from using a fiber optic headlight because it was easy to yank the cord out of the power source. Also, the tip of the fiber optic cord often got hot and the fibers would even break when the cord was coiled too tightly. Enova’s headlight is simply easier and more convenient to use. It is brighter, lightweight on my head, very portable, and requires no adjusting during surgery. And, the battery life is substantial. Shedding Light: Is there anything else you’d like to add Dr. Brantner? 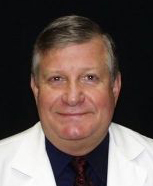 Dr. Brantner: Recently I performed a three to four-hour facelift procedure and wore the XLT-125. In the past, I’d never bothered with a headlight for facelift surgery because I need to move from one side of the patient to the other and I was often forced to use a lighted retractor. With Enova’s LED headlight I was able to perform surgery entirely using the XLT-125; no lighted retractor, no overhead light. I can’t imagine going back to a fiber optic surgical headlight. The Cyclopys XLT-125 is superb. 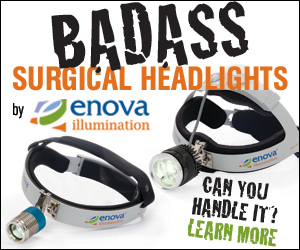 Have You Tried Enova’s Newest LED Surgical Headlights? Enova’s Cyclops XLT-125 amd XLT-225 LED Surgical Headlights are consistently brihgt, offer coaxial alignment, adjustable aperature and up to 24 hours of battery life. They are lightweight, perfectly balanced and durable.